This five piece take you back to haze from the cigarette smoke that filled the speakeasies of Chicago and the cabaret bars in the back streets of Montmartre. It was music – jazz music. It swung. It was the blues. It was the bluest kind of blues. It’s that thing they call cafe society jazz made up of smokey ballads, quicksteps and improvised choruses played over standard show tunes. Dressing in the style of the period, Hot Club ‘42 create the ambience of a Paris night club in the jazz melting pot of the 1930s and 40s. The rhythm section is made up of two guitars and a bass, a line-up pioneered by Django Reinhardt to provide a softer, more intimate engagement with the singer and soloists. Ian Adlington (clarinettist), doubles on sax for some numbers and provides the heart of the melody line. 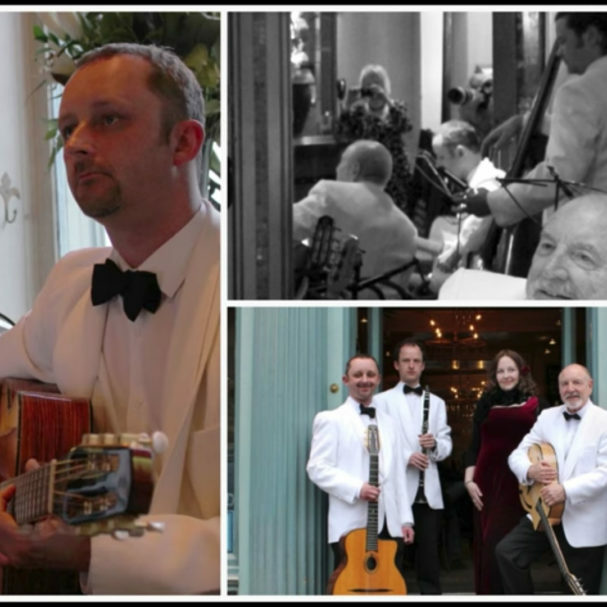 Our vocalist Nicky Bramble, is steeped in the jazz and blues of the period and brings a raunchy reality to the standards of the day. 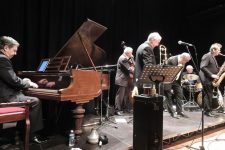 The backbone of the band are guitarists; Davey McCormack and Jonathan Waller, playing their iconic 1930s style Selmer jazz guitars, with Simon Winner holding them all down on double bass.